Hyundai Motor has a lot to offer to its clients. And for those with more attitude and style, there is the N Line, a sportier and aggressive version that is aimed at people who want to “drive a statement.” Now, when it comes to a sophisticated car—yet still a bold one—consumers are more than welcomed to try the New Tucson N Line. It represents the brand’s first SUV with the sporty ‘N’ look and feel. To mark its launch, the automaker decided to celebrate with sophisticated artwork. 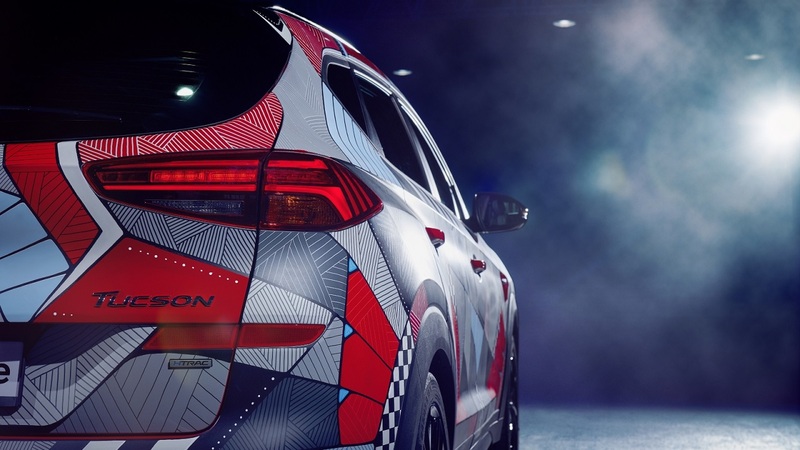 So, Hyundai invited German artist Andreas Preis to create the “Drive A Statement” Project Tucson. This unique work of art elegantly highlights the car’s sporty style and its ‘N heritage’. The New Tucson N Line nicely combines safety features, a popular design, and comfort, which are all wrapped up in an attitude worthy of its name. 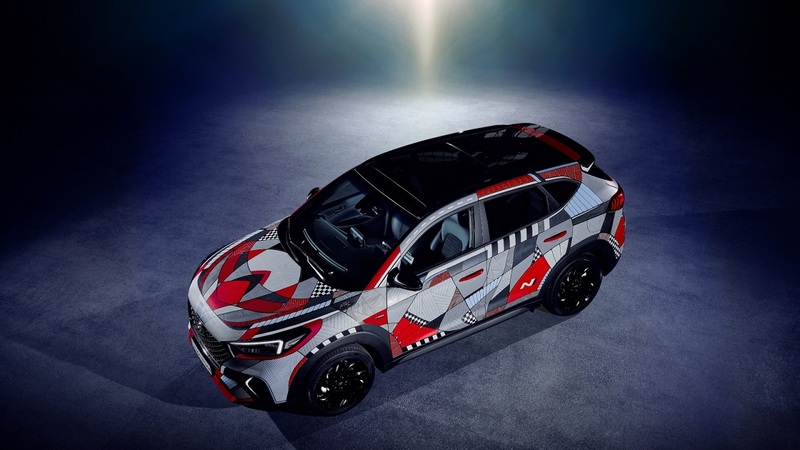 With the desire to show the real premium features of the car, the automaker hired the Berlin-based artist to utilize one of its cars as a painting canvas. Specialized in illustration, murals, and live paintings, Preis didn’t let the company down. In fact, he used the car to create abstract shapes and ornaments that truly reflect the vehicle’s true sporty and aggressive spirit. 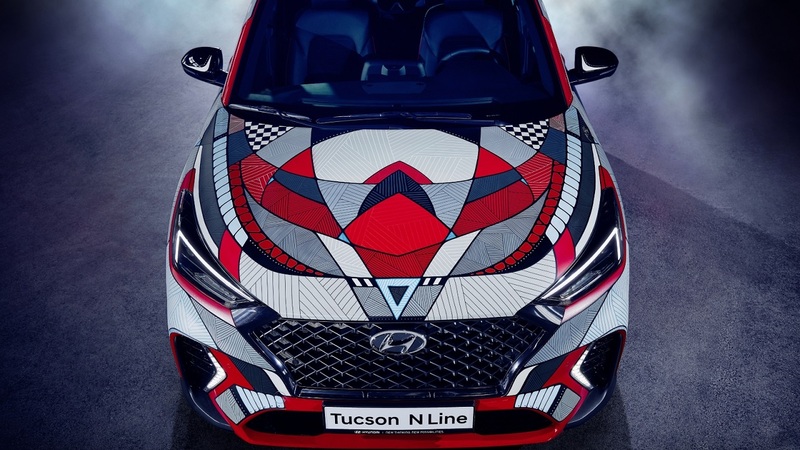 For this unusual project, Hyundai asked the artist to design an eye-catching illustration, one that reflects the New Tucson’s essence and high-top features. 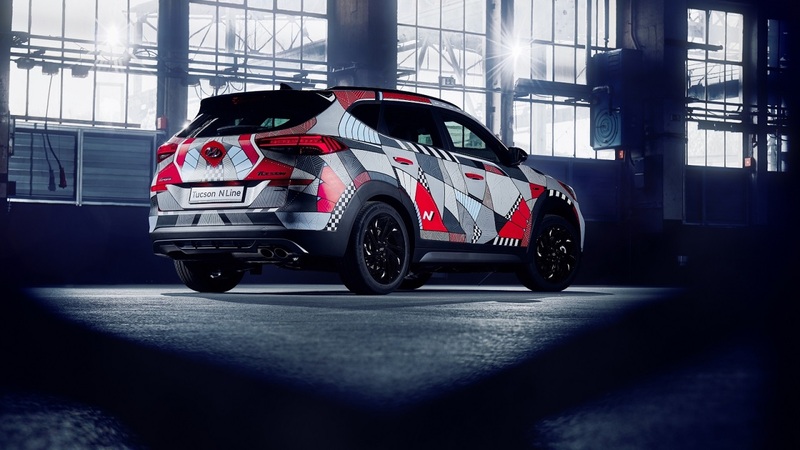 Inspired by the N Line’s legacy and its references to corners, chicanes, curbs, and chequered flags, as well as the livery of Hyundai’s i20 Coupe WRC and i30 N TCR models, the illustrator gave birth to a one-of-a-kind canvas, which he nicely embedded within the car’s visual genetics. When you look at the car in its entirety, you can observe its dynamic spirit, whilst the multicolored pattern reflects the rebellious side of the four-wheeled vehicle. The background’s color is Engine Red, which carries the shades and lines of the N Line color palette: black, white, and light blue. The artist’s design brings a key element in the entire ensemble; it gives the vehicle a more aggressive feature and sporty front. These exact elements nicely highlight the car’s elegant lines and black accents on the side mirrors and rear spoiler, as well as the dark alloy wheels and N Line badge. Upon completing the design, the artist meticulously transferred it onto the car by hand, with the whole process taking up to 72 hours. “I was very excited to be asked by Hyundai to create an illustration on a New Tucson N Line. It is not every day you get to create an artwork where a complete car is the canvas. With this project, I was able to turn the car into a statement of my own,” said Andreas Preis in a press release. “With the New Tucson N Line, we are appealing to a new customer base compared to the regular version. 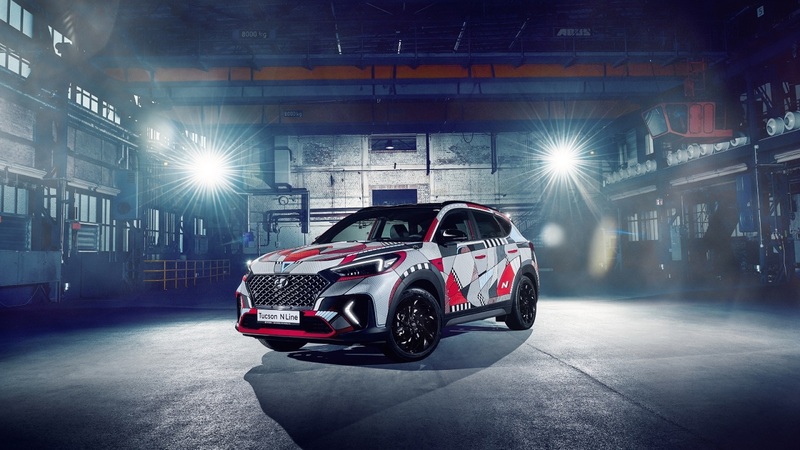 We, therefore, wanted Andreas Preis to create the ‘Drive A Statement’ Project Tucson to demonstrate that this is a special new model for Hyundai. I believe he has achieved this, and it fits perfectly with our claim that you are driving a statement. 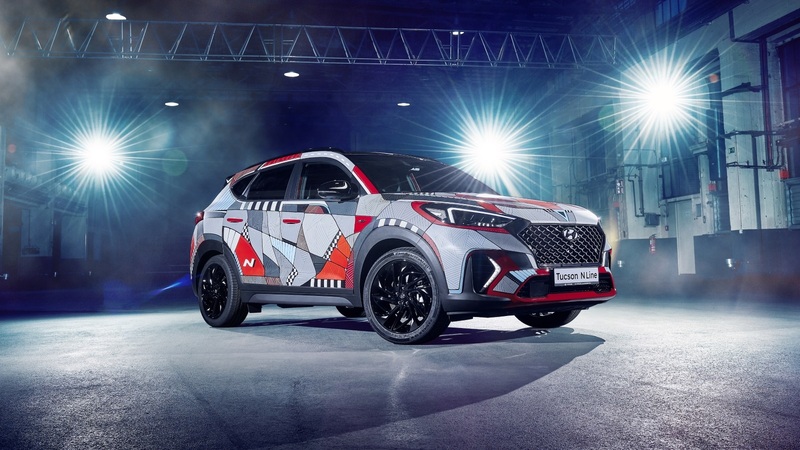 We will soon be displaying this unique car at events around Europe,” concluded Andreas-Christoph Hofmann, Vice President Marketing and Product Hyundai Motor Europe. This is a car you either love or hate, because it looks very much like a camouflaged car that manufacturers use to deceive journalists’ eyes. So, would you go downtown with such a vehicle? Let us know your thoughts by sharing your opinion in the comment section below!